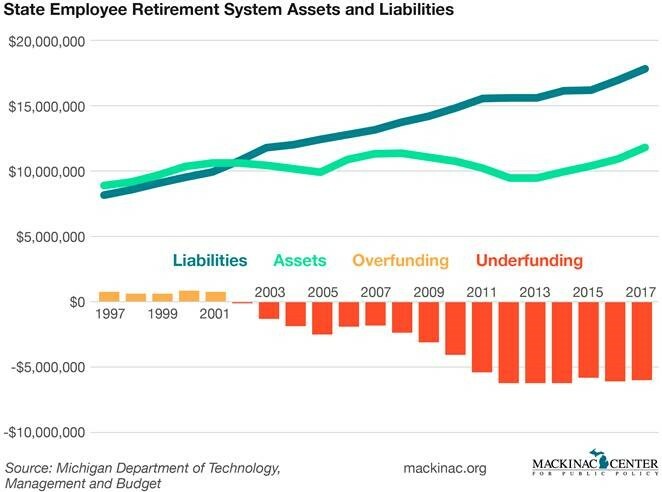 When the state of Michigan closed its defined-benefit pension plan to new employees in 1997, it still needed to pay for the benefits that existing employees had earned. Unfortunately, the state went from having saved enough money to pay all promised benefits to a $6 billion underfunding gap. New data from the state shows that it is finally starting to catch up. From 1997 to 2002, lawmakers had enough money saved to pay for the pension benefits promised to state employees. But between 2002 and 2012 the state failed to keep up with the growing costs of those benefits and it generated $6.2 billion in debt to the people in the retirement system. That debt stayed about the same for the next several years. When lawmakers promise employees a pension, they have to guess at what these pensions will cost in the future. That estimate depends on a lot of factors, like how long employees are going to collect their pensions and how much interest the money set aside will earn. State managers annually reassess this information. According to the latest assessment, unfunded liabilities fell by $100 million in 2017. This is because the state outperformed its assumptions, but also because the state changed its assumptions. The change is going to make it easier to meet assumptions in the future, too, making it less likely the state will add more debt to this pension system. The state pays its current retirees extra insurance on top of Medicare, or prior to an employee’s Medicare eligibility, if they retire early. These benefits are different from pensions because they lack the constitutional protections, meaning the state could reduce or even eliminate them. The state stopped offering blanket pledges to pay these benefits to new employees and instead offers contributions to a savings plan to help pay for future retirees’ insurance costs. Nevertheless, the state decided to set money aside to pay for current retiree health benefits costs. Lawmakers have saved $2 billion to pay for these benefits and would need another $7.5 billion to catch up on the rest, if lawmakers choose to prefund the costs instead of reducing the benefits. These are positive changes. It’s been too easy for politicians to promise retirement benefits now and push the costs onto future taxpayers. That is why state and local governments’ largest creditors are not banks or bondholders or anyone else that loaned these governments money, but rather their own employees and retirees. That’s unfair to taxpayers and government workers alike. But the latest reports show that reforms to these systems are slowly helping the state rectify the problem.